Seabourn Quest docked in Puerto Madryn, Argentina. © 2014 Yuriy Rzhemovskiy for Avid Travel Media Inc. I was in the shower when the announcement came over Seabourn Quest’s public address system on Monday afternoon. It was the captain’s voice, so I knew I had better listen. I shut off the water and poked my head out of the shower: There had been a brief power outage to the bridge’s navigation system, and in the interest of safety, we could not continue our voyage as planned. 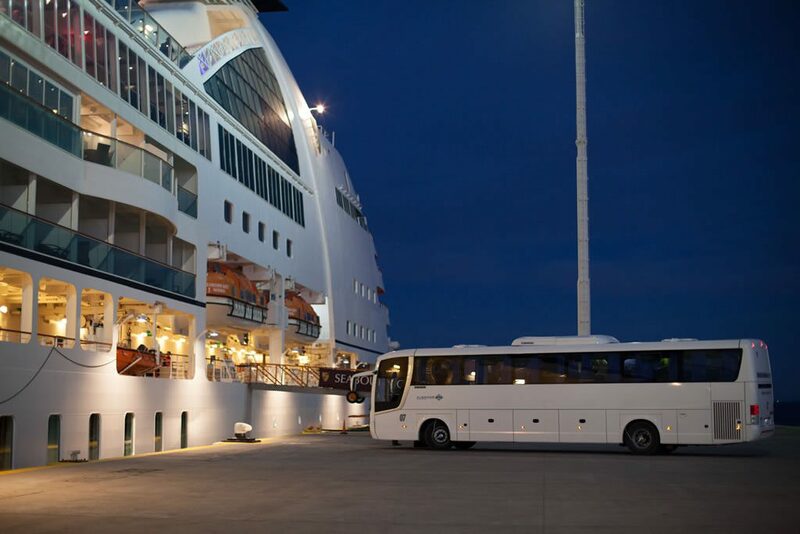 Captain Bjarne Larsen, consulting with Seabourn’s offices back in Seattle, had determined that the best course of action was to deviate to Puerto Madryn, Argentina, where we’d pick up a technician and a spare part — two days from the moment the initial announcement was made. At stake: Port Stanley in the Falkland Islands, which was to have been our next port of call, and possibly, Antarctica itself. That evening, at the Captain’s Welcome Aboard Reception, the Danish officer addressed the audience with heartfelt frankness. “I’m disappointed that I am disappointing you,” he told the more than 400 guests on board. He held up his hands to make a circle with his forefinger and thumb, illustrating the size of the part that had caused the problem. The captain made no assurances, other than to convey what he knew for certain. At approximately 2 p.m. the next day, we would come alongside in Puerto Madryn, he said, overnight there to wait for the arrival of the needed part the next day, install and test the part, then set sail for Antarctica, most likely, at around 6 p.m. on Wednesday — if all went as planned. Earlier in the day, following his initial announcement, the captain had also gone out into the public areas and spoken with guests. What he heard repeatedly was that while guests were grateful that the captain was considering their safety, many were disappointed that they would be missing the Falkland Islands. 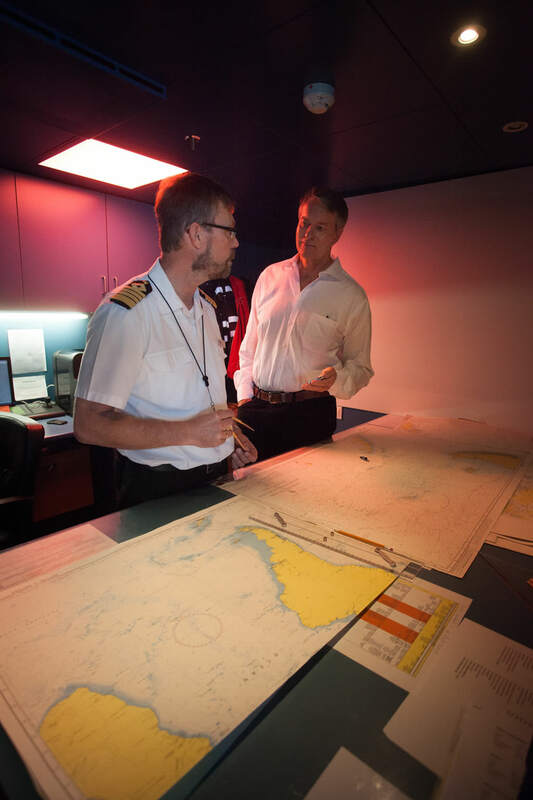 Later that night, the captain expressed to the head office in Seattle the desires of the guests: to prioritize the Falkland Islands and Antarctica. 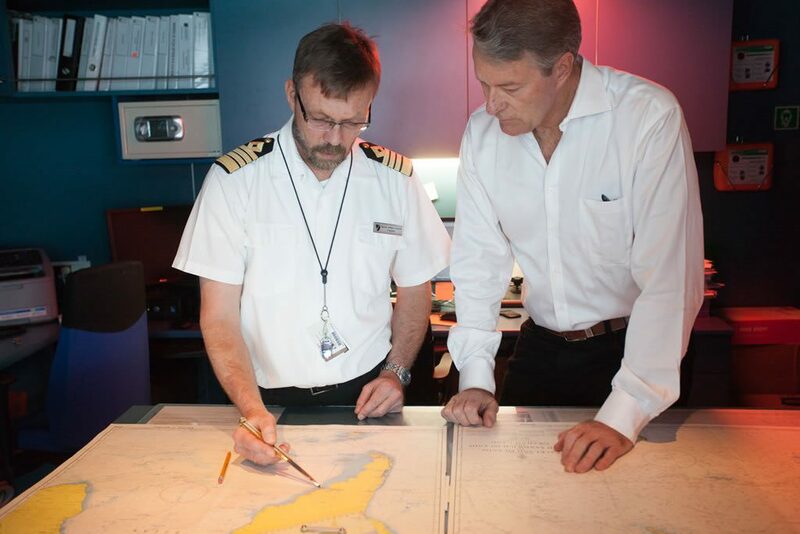 Captain Bjarne Larsen explaining Seabourn Quest’s deviation to Ralph Grizzle. © 2014 Yuriy Rzhemovskiy for Avid Travel Media Inc.
Puerto Madryn was sunny and warm on the afternoon that Seabourn Quest docked alongside a long pier that led into the city center. The ship’s Destination Services department had organized tours, including a whale-watching excursion that guests later raved about. Gushed one couple: A baby whale had come close enough to the tour boat for guests to touch the beautiful creature. 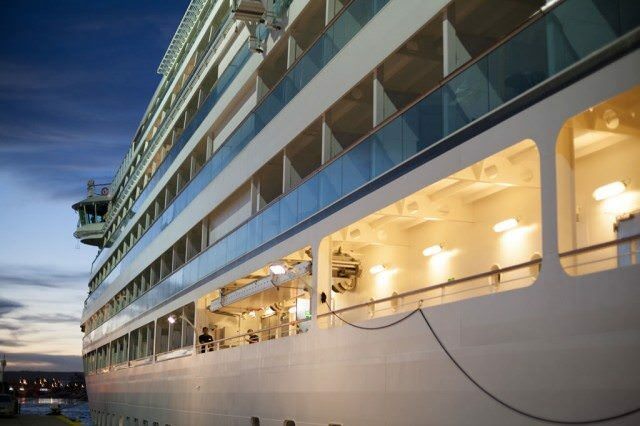 Guests enjoyed tours in Puerto Madryn, which Seabourn Quest’s Destination Services department organized — practically overnight. © 2014 Yuriy Rzhemovskiy for Avid Travel Media Inc. While guests were out touring or strolling the beaches and city streets, the captain and his officers were communicating with the head offices in Seattle. The “mothership” was keeping track of the technician, who was flying from Italy. So far, so good. All was going as planned, and it appeared the technician would arrive ahead of schedule. At around 9 a.m. on Wednesday morning, Cruise Director “David E.” (Greene) sounded as if he had something exciting to say when he came over the public address system — an indeed he did. “The captain has asked that all guests be back on board Seabourn Quest at 2:30 p.m.” That was three hours ahead of schedule. Something was up. At 3 p.m., Seabourn Quest was getting ready to sail. Testing on the spare part had been completed, the captain announced, and much to our surprise, he added, Seabourn Quest would be charting a course for the Falkland Islands — with no interruption of our time in Antarctica. “I heard some feedback from my officers who were out on deck that there were cheers around the ship,” the captain said to me when I asked about the reaction of his announcement. Deviating to the Falkland Islands when Antarctica was a straight shot south came at great expense for the company, namely in the cost of fuel to put the pedal to the metal and make a run for the islands. Regulations require ships cruising Antarctica to use marine gas oil, which is less polluting but considerably more expensive than so-called heavy fuel. The distance from Puerto Madryn to Port Stanley was more than 600 nautical miles. Seabourn Quest would need an average speed of 17 knots to make it by Friday morning. Then, after spending most of the day in the Falklands, we’d speed toward Antarctica, keeping only hours ahead of a low-pressure system that was moving into the Drake Passage and threatening rough seas. We are scheduled to be across the Drake and in the Antarctic Peninsula on Sunday, December 7. We’ll spend five or six days in Antarctica, depending on the weather, and arrive a day after scheduled in Ushuaia, on December 14. Seabourn Quest concludes the cruise in Valparaiso on December 20. Companies are often defined by the ways they respond to adversity. Captain Larsen, his crew and those back in the home office in Seattle did everything right. First, the captain prioritized safety for guests and crew. Next, he informed guests what had happened and kept them informed with each new development. The captain made himself available for guests to ask questions and to express their concerns. On extremely short notice (around midnight Seattle time), the company arranged for a technician and spare part to travel halfway around the world as quickly as possible — and then to make it down to Puerto Madryn. Then, the remarkable conclusion. Despite the odds, the captain had been able to maintain the original itinerary, with only slight modifications to the timing. Plus, guests got an extra port of call, Puerto Madryn. Similar, but not quite the same, if this writer may say so, Captain Larsen. Trains don’t need to fly technicians halfway around the world to install parts. Trains don’t need to consider currents or storms and potentially rough seas as well as the desires of guests on holiday. Trains get people from point A to point B. Ships, on the other hand, especially those conducting voyages like the one we’re on fulfill lifelong dreams. Tonight, our ship is moving again with guests who were initially disappointed that they may not be able to realize their dreams — until a remarkable thing happened. Those who dreamed of visiting the Falkland Islands will do so, thanks to a caring captain and the crew and company that backed him. Captain Larsen charting the course to Port Stanley. © 2014 Yuriy Rzhemovskiy for Avid Travel Media Inc.
What great customer service!!! I would bet not one person aboard that ship will have anything bad to say about the cruise line or the Captain. From what I have read over the years on Cruise Critic, Viking should be taking lessons from Seabourn. An amazing feat. Well done Captain Larsen and his team.